Jungle Red Writers: Some Like It Hot! RHYS: The other day I bought a chicken sandwich at a deli. It was a really good sandwich, crispy bread, lots of white meat chicken, lettuce, tomatoes and I was really enjoying it until.... I bit into a chili pepper. A really hot chili pepper. You know, the kind that makes your eyes water. I went up to the counter and complained and was told, "Most people like it that way." As if I was an old fuddy-duddy who didn't appreciate good food. This is really stupid. If you eat a chili, all you taste from then on is...chili. It could be chicken or cardboard, it wouldn't matter. I've certainly become aware that food tastes are changing with the latest immigrants. We all eat tacos now, we even eat mole which is really spicy. Indian food is showing up more often. Thai food is everywhere and that's pretty hot. And it seems that to eat hot food has become a macho sort of thing. Look at those commercials for buffalo wings--the kind that make steam blow out of a person's ears. I watch people (usually men) spray tabasco sauce all over their breakfast eggs, looking around with satisfaction as if to say "Look at me. I'm fearless." cooking, or grilled fish, unless it's blackened? I'm afraid that I still like subtle flavors and good fresh food. Lamb chops grilled, fillet of petrale sole, lobster, oysters, fresh asparagus. Mmmmm. I do enjoy an occasional curry or even a Thai meal, but not the really hot ones. Chicken tikka masala, rogan gosh, sag paneer..which is spinach with curd cheese. 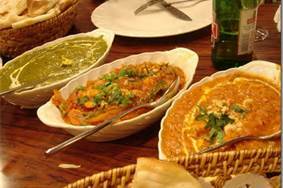 But really good curries retain the flavor of the food. A chicken sandwich with sliced chili peppers is a wasted sandwich. So what about you, Reds--do you approve of this fascination with really hot and spicy food? Even though I do cook some dishes that are spicy, I am not a fan of overly spiced, hot dishes that bring tears to your eyes. Chili peppers on chicken salad? I’d be upset, too. Since they seem to be such a peculiar addition to a chicken salad sandwich, I’d have thought that the deli menu would have mentioned the inclusion of sliced chili peppers on the sandwich, which would have given you the opportunity to ask for them to be left off so that you could enjoy the chicken salad . . . . The flip “Most people like it that way” seems like a rather strange attitude since their business would depend on customers returning to eat there again . . . . I do like hot food, but not as hot as I used to Rhys.And they shouldn't surprise you with it! Well, I think you have the right to complain about this one, Rhys. How disappointing. I heard food writer Michael Pollan on the radio the other day, talking about his new book, Cooked: A Natural History of Transformation. One of the things he said about eating out (or eating processed food, which is sometimes the same thing) really resonated with me: when you allow someone else to prepare your food, you also allow them to choose the quality and freshness (or not) of the ingredients, and you lose control of the whole process. Which made me think about situations like yours, where you lose control of how the food is prepared, as well. We once went to a renowned local steakhouse, where the steaks are supposed to be the best in Cincinnati. My steak, however, was so heavily salted that it would have been difficult to tell whether it was a "good" steak or not; I could not taste any actual meat flavor. "Most people like it that way" is pretty meaningless, since so many people, especially in the US, have lost their discrimination for what is actually good, fresh, and flavorful. How sad, and how sad that it's so difficult to enjoy an occasional meal out that is well-prepared and delicious. I used to have this husband who loved Tabasco sauce and would pour it on everything. Kind of makes me wonder why I bothered cooking at all. restaurant or take-out food, most of the time it's so salty I can't even tell what it is. A curious thing, though--I'm a big Jamie Oliver fan, and many of Jamie's recipes call for a smidgen of fresh red chiles (or "chilli", as Jamie spells it.) Our supermarkets here in north Texas always have fresh green chilis, but NEVER red. Hmmm. PS Karen, I want to read the Michael Pollan book. Do you recommend? Deb, I have not yet read his new one yet, but all his other books I've read were great: The Botany of Desire, The Omnivore's Dilemma, and In Defense of Food. He also wrote a wonderful little book on building his own writer's hut, an outbuilding on his home's property, that I read while overseeing an addition on our house. That one is called A Place of My Own. He's a great writer, and his way of looking at food is eye-opening and interesting. No endorphins for me, Austin. I'm just looking for the nearest glass of water. But I think you're right, Lucy. I can't tolerate food as hot as I used to eat. And I've never managed to eat neat jalapenos. No, not water! Doesn't that make it worse? I so like spicy food--but not so much that it makes you unable to breathe. You have tone careful of those red things in Szechuan food, right? I do put hot pepper flakes in scrambled eggs, though.. I like hot, too... but not seriously hot. I think you have to have grown up with it to be able to handle truly hot Indian food or hot hot peppers. I do like hot peppers on my Italian subs. So I like Michael Pollan, agree with his focus on eating fresh foods not packaged. But sometimes (am I the only who thinks this?) he drifts over into schoolmarm territory in terms of telling us how to live. And I'm someone who virtually never eats or cooks anything that comes packaged. But don't take the fun out of eating out... please. The occasional Whopper with Cheese isn't going to kill me. First off, Rhys, that person who made the flip remark should have been reported to the manager and/or owner. Customer service is key to a successful business in the current financial climate. No excuse for rudeness! I love hot, but only with certain things. Spicy is great, and as most good cooks will tell you, spicy does not equal burn your tongue off. I agree that too much hot kills your palate. Hallie, if the occasional cheeseburger is going to kill me, at least I'll die happy. I'm a firm believer that the emphasis on everything we eat is bad for us is just flat silly! And don't I just sound as pompous as some of those who tout the idea that the only way to eat right is to eat how they eat, lol. I have a question---did the "menu" list the ingredients of the sandwich? If so, was the jalapeno listed? I always have to ask what is in any dishes I may order as I am allergic to mushrooms. I always ask no matter if there is a list or not. However, I do love spicy, especially the style of New Mexico. My mother was born and raised in Arizona and she had her hot sauce with her at all times...even in the nursing home. How awful for you! Even in Tucson they give you a choice or a warning about hot peppers, although I am pretty sure the chili peppers were in use here in Arizona and California long before European arrival. There is archaeological evidence in Ecuador and elsewhere that chiles were domesticated over 6,000 years ago and were one of the first crops cultivated in the Americas. I love the flavor of chiles but not the heat, so I always use the milder ones. In restaurants I sometimes request they be left out, because I find they are often called mild when they are very hot. Our favorite Mexican restaurants in California and Arizona identify the variety of the pepper rather than a subjective evaluation of heat. Don't drink water. 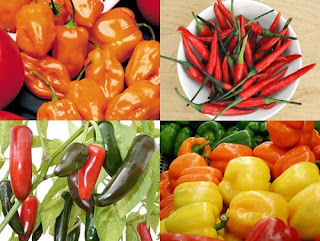 The capsaicin is carried in the oil of the pepper. Eat a piece of bread or flour tortilla to absorb the oil. Auntie-Mom carries a packet of saltines in her bag for such emergencies. I don't eat anything "hot" , "spicy", "tangy", or even "zesty"....and I'd prefer not too salty. Since I once had a horrible allergic response to hot peppers..making my entire face swell, including the inside of my mouth ....I don't even want to be in the same room with hot peppers. No Jalepeno's or even banana peppers, chili peppers, etc. Also, I prefer to actually taste the food, not the spice. Rhys, that was just awful! It was definitely NOT the sort of sandwich that called for any sort of hot pepper. And it should have been mentioned in the menu. I am not a fan of spicy foods. I do like flavor and I do like to cook with herbs and spices but I don't go overboard with the hotter spices; just a dash will do. If I eat a restaurant meal that tastes heavily of a hot spice and the menu gave no warning of how heavily spiced it would be, I'd avoid that restaurant in the future, or order a different meal there if I had no choice about returning there, such as for a meeting or a special event. One of the big mistakes people make with Mexican and Latin American/Caribbean cooking is to think it's all loaded with the hottest peppers available. Not so. There are tons of different varieties of peppers ranging from quite mild to burns the mouth. And even if you are using the hottest, you only use a tiny bit for flavor. If you burn out someone's taste buds, they can't taste any flavor. Five-alarm anything has no real taste, at all. Reine's absolutely right about bread, tortilla, or rice ( or even potato) to counteract the sting of too much hot pepper. Sorry the guy at the restaurant was such a jerk, Rhys! I'm basically a chicken here (not as in sandwich, but as in not willing to OD on those endorphins Austin educated us about!) I like some spice, but not so hot that I can't taste everything else. Peppers don't belong in chicken salad! Period. I like some things spicy, but usually mild spicy. Like Tex-Mex. I do love boiled crawfish when they're in season, but too many restaurants ruin them by overspicing them. Fresh crawfish have a delicate sweet taste which is obliterated when peppers, etc are tossed in the seasoning. So, spice is good but in its place. I'd be just as happy if I never had to encounter any kind of pepper. Chili, red, green, yellow or black. I was raised on food that was lightly spiced and tasted delicious. Mexican food is or overly spiced that I only order salads without the "salsa". I ate a plate of spaghetti one time that was burning my lips as the fork was approaching my mouth. Awful!